ISS Portable Barriers make Temporary Tracks as safe as Permanent Tracks. Why ISS Safety Barriers are so portable and flexible. Why ISS Safety Barriers protect so well. 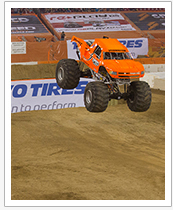 Robby Gordon’s Stadium SuperTrucks is an off-road racing series that tours the country. To succeed, the series needed to set up a safe truck racing track in a stadium, then move everything to the next city and set up again in a different arena. Robby Gordon chose ISS not only because they’re the most portable, allowing for quick set-up and fast wall repair if necessary, but the barriers have proven to keep both drivers and spectators safe during every action-packed event. The Sportscar Vintage Racing Association (SVRA) introduced the first Vintage Racing Gran Prix at Amelia Island, Florida where they constructed a 2.1-mile course from scratch at the Fernandina Beach Airport. With an active runway on site, protecting drivers and spectators was paramount, so using hay bales as the only barricades wasn’t an option. SVRA chose ISS ProLink’s proven barrier technology to separate the racetrack from fans, keep drivers safe by holding them on track, and minimize potential damage to vintage vehicles. With just one day for setup, the barriers were quickly and easily installed by just two crewmembers. SVRA plans to reuse the barriers again and again over the next 5 years. There really was no good alternative to Impact Safety Systems for us. They had the only barriers that could work for our stadium race series. We purchased Impact Safety Systems Barriers on behalf of our client Shell for its North American Eco Marathon events. We used ISS ProLink Barriers to line the streets and separate the marathon track from the public. For the Rooftop Drive portion of the event, we used ISSKISS Barriers to create a clearly visible course. Straightforward pin connections made them so easy to work with andwe simply filled every third barrier with water to anchor against the wind. In between events, Shell loaned the KISS barriers to Fiat/Chrysler for their “What’s New” mediademonstration at FCA’s Chelsea Proving Grounds. When not in use, the barriers were conveniently stacked in our storage facility. Upon completion of the three-year series of Eco Marathon events, Shell donated all the barriers to the Henry Ford Museum for its annual Maker Faire. Suffice to say, the ISS Barriers were well worth the investment. After doing our homework, we chose Impact Safety Systems (ISS) ProLink barriers. There were alternatives, including using cement, renting or buying analogous interlocking barriers from other sources, but they simply didn’t meet our safety standards. And when we factored in delivery, cost, and deployment time, ISS Prolink was far and away the smartest choice.